Thank you for the endorsement. Such opinions go a long way in helping keep me motivated to continue working on this project. I should take time to make a better video than the one above. Although making displacements from a single epoly template is possible, you get better results by making a template that is actually a bunch of valid brushes (as each element). There is a tool in WW collection (ShellVex) that can convert the faces to brushes... but I didn't demonstrate it here. i started to learn 3dsmax with some youtube tuts and installed wallworm. i made a simple custom cube for a first test as you can see in the images below. wall worm is working as expected, collision worked too but my materials were not the same like in 3ds. only the basic diffuse color is added like you see in the picture. what did i do wrong and how can i solve this? i guess this is a dumb question - thanks in advance for any answer and thank you for wallworm! .. but my materials were not the same like in 3ds. So the answer to this question is generally straightforward. You need to "Bake" the procedural Noise texture to a Bitmap. All procedural maps (Noise, Cellular, Substance, etc) must be baked into bitmaps. Depending on what you are doing, this can be either using the Render Map function in the Material Editor or it could be using the Render To Texture (RTT) utility. 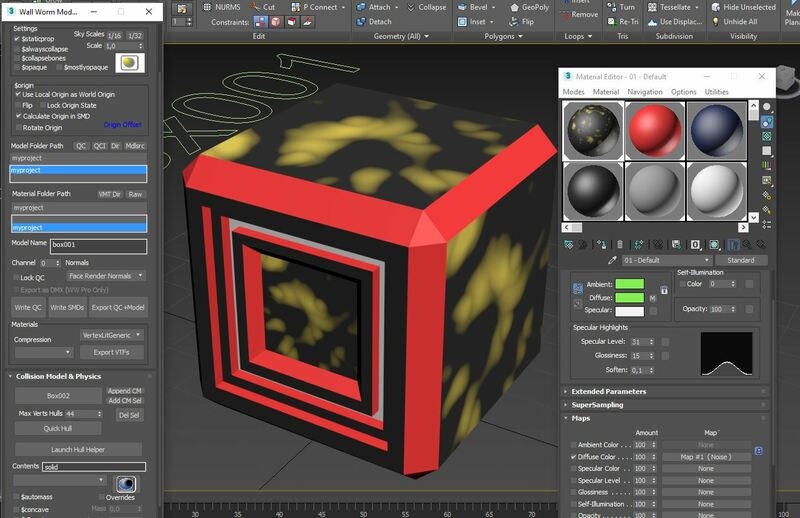 The render map will create a bitmap for a texture and the Render To Texture can take a complex set of textures and bake them to bitmaps according to the UV layout. For both, make sure to create TGA bitmaps. 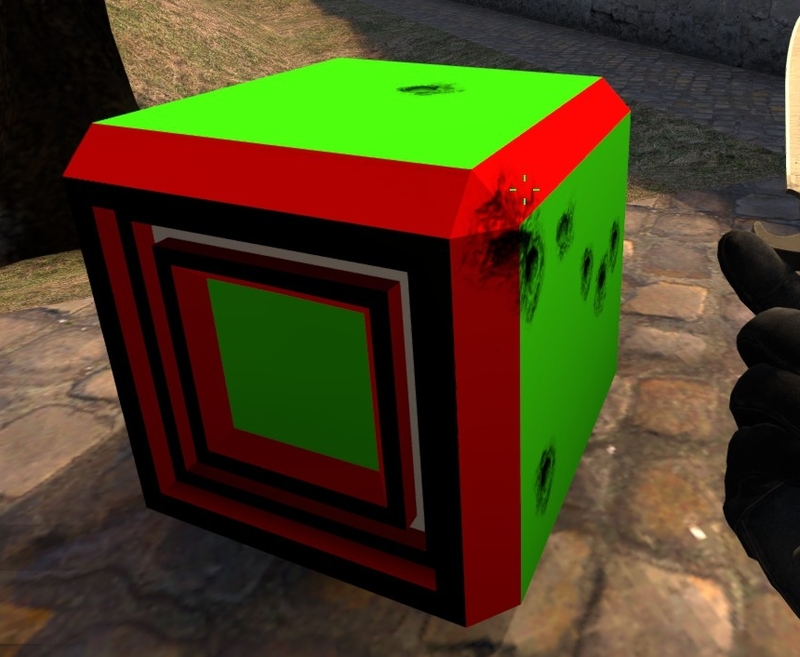 The RTT will replace your material with a new material where Bitmaps are used instead of the procedural textures. If you use another method, you'll have to manually assign those bitmaps. Hopefully this helps you understand some more. thank you very much for taking your time, informative answer. Recent updates to WW have included a bunch of new icons/toolbars/UI updates. I did not know that these updates broke the installer/updater for 2016 and older as I've been primarily working in 2019.3 and later. Today I loaded a new update for WW that will properly install/update into 2016 and older. That being said, I strongly urge all WW users to use 3ds Max 2019.3 or later. Why? Too many reasons, honestly. But here is just one example of the kinds of things you can do in later versions of Max. (See the new site Hammered to the Max for even more videos that precede this video). @shawnolson Looks great, this is the first thing I dreamed of when I came to the antiquated hammer tools from modern modeling software. Little did I know it was a thing! However, as a Maya lover, I was wondering if there was any way to install wallworm on Maya with basic brush import/model export functionality. If not, I suppose I could just pick up 3ds. Wall Worm started as a work of passion that proceeded so extensively and rapidly only because of my own particular goals (centered in a Max pipeline). At this point to start a new branch of WW (devoted to such an old engine) on a new platform would be a huge investment of my time with little returns. As such, it is very unlikely that there will ever be a version of WW outside of 3ds Max. That being said, if you are already competent in Maya, you will certainly pick up Max fairly quickly. Also, in general news about WW, Autodesk recently featured an article they asked me to write about the development of Wall Worm. See From Black Sheep to Black Mesa and Beyond. More excitingly, I will be the keynote speaker this year at GDC for Autodesk on 3ds Max. So if you're going to GDC, make sure to come see talk that includes a lot of information about using Max and developing tools for Max.